As I discussed in the previous post, a little girl called “Tattling Tootsie” was used to promote an earlier Stern & Saalberg product, Bromangleon dessert powder (which was also a Hirschfeld invention). But Tattling Tootsie doesn’t seem to have been used to promote Tootsie Rolls. I don’t know what Clara Hirschfeld looked like. But this Tootsie Roll tyke in no way resembles Tattling Tootsie used in the Bromangelon ads. The Bromangelon Tootsie is from around 1907. As for the Tootsie Roll girl, there are several clues that help date this ad. The wrapper in the image was introduced in 1913. The earlier wrapper said “Chocolate Tootsie Roll”, the new wrapper and packaging introduced in 1913 added “Chocolate Candy Tootsie Roll.” I do know that in 1919 the wrapper looked totally different, but it is most likely that by 1917 at the latest Tootsie Roll was not using this style wrapper. So I would put this placard as being before WWI, but no older than 1913. I think these two little Tootsie girls tell us more about changing images of girl-hood and advertising than they do about Clara Hirschfeld. The earlier Tattling Tootsie is explicitly connected with the home. Her outfit and pose are unambiguously feminine. She is prim and proper: her dress and hair are neat and controlled. Bromangelon was marketed to housewives as a convenience food, so perhaps the neat and prim little girl also suggests the successful mother who keeps her child looking so well-tended. But the later Tootsie Roll girl seems more mischievous. The bow in her hair assures us she is a girl, but her drooping socks and ambiguous clothes suggest more outdoors and active adventure. Her school books locate her outside the home, away from parents and parental controls. And this girl is a little naughty: she won’t wait to eat her Tootsie Roll. This ad may have been aimed as much at children as at adults; in this period, it would not have been uncommon for a child to purchase such candy on her own, much as suggested in this ad. By the way, I believe the artist has taken some liberty in drawing the Tootsie Roll candy to monstrous scale for visual effect. The tube in the girl’s hand seems to be immense, bigger even than her school books. But actual Tootsie Roll candy as you would have found it for sale in this period was probably more like 3-4 inches long. Thanks to John and Stephanie Cook for their permission to share this image and for their enthusiasm for candy sleuthing. If you’d like to experience a bit of Victorian Christmas this year, you might visit the David Davis Mansion in Bloomington, Indiana. Historical interpreters at this museum are re-creating some late 19th century holiday traditions for their visitors. One might surprise you: Christmas candies in the shape of cockroaches! “Candy was a big deal to kids. Getting candy only happened on very special occasions,” says Young. For Christmas, Victorians gave them lots of candy in stockings or as gifts. Some of that candy was made to look like items in nature. “This was a time in which a lot of exploration is occurring all over the globe,” Young says. “Victorians are very excited about what they’re finding. They’re fascinated by the natural world, even the smallest parts, like insects.” That fascination inspired their candy-making, so they created [candies] that looked like carrots, lobsters, rabbits, beetles, spiders, and even cockroaches. Today the Davis Mansion is offering a modern interpretation of those Christmas Cockroaches, made of molded chocolate. But the candies the Davis children received long ago would not likely have been made of chocolate. The museum has a letter received by Sarah Davis that describes a “sugar cockroach” received by a young friend in Massachusetts. A “sugar cockroach” would be a molded fondant candy, similar to the inside of a Peppermint Patty. Candy corn was invented around the same time; like cockroaches, corn was another of the plants, animals and insects that were popular shapes for the candy of the day (see my article on the history of candy corn at TheAtlantic.com). Now, I wonder why candy corn was so popular, and candy cockroaches just didn’t catch on? And what about candy bedbugs? Of all the “jazzy” candy bars from the 1920s, this one still seems the most strange. Candy and chicken seem about as far apart as you can get. What were they thinking? Sperry Candy Company of Milwaukee WI introduced the bar in 1923 with the slogan “Candy Made Good.” Good like candy, but also good like chicken dinner. An ad to the trade explained the reasoning behind the name: “A name which suggests the best of something good to eat, and known to every child.” These children of 1923, I’d love to meet them. Sperry seemed to think that a big roast chicken was the best lure for the kiddie market. Chicken Dinner originally sold for 10 cents, the high end of the candy piece market. Sperry described it as “an expensive, high grade candy, put up in convenient 10 cent packages.” Neither in the ads nor on the package did they say much about what was actually in the candy bar. The innovation and excitement of Chicken Dinner wasn’t nuts or nougat, it was the name. Chicken Dinner meant quality and goodness. What it did not mean, at least not directly, was meal replacement. I’ve read in more than one account of candy during the Depression that bars like Chicken Dinner and Denver Sandwich were popular in part because they promised a kind of imaginary substitute for more expensive real meals. Now I’m beginning to doubt that story. For one, both those bars were first marketed before the Depression, so the context of empty pockets and hungry bellies doesn’t explain these names’ origins. Candy bars in this period had all kinds of outlandish names. Choosing to call your candy bar something so unlike candy, but still appealing, seems a great way to get a second look in a crowded field. But more than that: the idea that a candy bar might be contemplated as somehow equivalent to chicken or a sandwich sounds much more like our contemporary “anything goes” food culture. I suspect a candy bar named “Pizza Dinner” today might not take off the way Chicken Dinner did. It was one of the best selling candy bars in its day, and remained on the market for some 50 years. It wasn’t just that everybody loved a good chicken dinner. And it probably didn’t have too much to do with the bar itself. It was advertising. In the 1920s, not everyone realized that advertising was the secret to success. Candy bars that were heavily advertised from their inception would go on to bigger and bigger shares (anyone could have realized in the early 1920s that Milky Way and O, Henry! would be the ones to watch). There was no TV in those days. Radio advertising wouldn’t really catch on until the 1930s. So live interactions with the candy-buying public were the only way to get the word out. Chicken Dinner billboards were a common sight around the land. But Sperry wasn’t just waiting around for potential customers to pass by to see the sign. 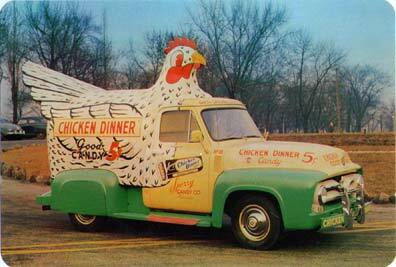 In 1926, Sperry’s advertising experts came up with the idea of putting Chicken Dinner signs, and big colorful chickens, on automobiles and driving them around cities drumming up excitement. Back up was provided by teams of window trimmers, artists, and even circus clowns. Behind the scenes, Sperry was assigning advertising staff to work permanently in the field to support distribution and sales. This was a new idea; most companies sent their goods off with jobbers who made the distribution rounds in different locations and didn’t stick around to provide marketing support. The best think about Chicken Dinner besides the name was the chicken cars, which became quite elaborate. Fleets of Chicken Dinner cars or trucks would arrive in town to deliver the candy goods. Here you can see an image from the mid 1930s; here’s a later model. What did people think the first time they saw one? Today candy novelties are mostly cheap plastic toys, usually generic one-offs. Advertising and brand loyalty are the keys to the success of the biggest candy companies. High-quality candy novelties were much more important in the early days of the candy industry. Success in the candy business hinged on moving quickly to introduce new kinds of candy and new novelties to catch the eye of child or adult shopper. Higher priced candy was often bought as a gift, and clever or eye catching presentations would increase a gift’s value. For children’s candies, the novelty could transform a simple candy into something much more appealing. These candy dolls from the 1920s were manufactured by Huyler’s, a large confectioner better known for quality chocolates. Although these goods are for children, they would have been sold at higher-priced shops and department stores alongside Huyler’s chocolate goods and similar candies. Each was made by hand. These candy dolls appear primitive to the modern eye, but must have been charming and appealing to a child in the 1920s. Here is Simple Simon, fashioned of candy sticks, with his chocolate pies. The book motif is cleverly carried through from the shape of the box to the hand-written rhyme, with the figures and candies playing out the theme. The children of today are the candy buyers of the future. [These novelties] give the manufacturer a chance to get first place in the child’s affections.